The Franschhoek Wine Tram is undoubtedly the best way to experience the Franschhoek Valley’s wine estates. It eliminates the need to drive, and takes you to some of the valley’s most popular and scenic estates. They have now made it even easier to visit Franschhoek’s spectacular wine estates with a transfer from the V&A Waterfront with City Sightseeing. The newly launched Franschhoek tour departs from the V&A Waterfront at 9am. The bus is kitted out with air conditioning, free wifi, charging ports, comfy seats, and screens showing all the info you need about your Cape Town trip. 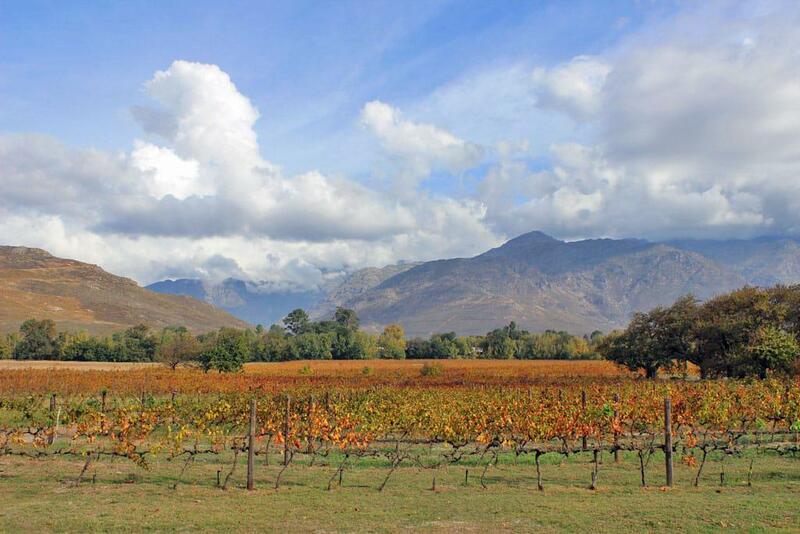 The drive takes around 45 minutes, and takes you to the Drakenstein Station in Franschhoek where you can connect with the Wine Tram and begin your adventure. After your day exploring the Franschhoek Wine Route, hop back on the bus for your transfer back to the V&A Waterfront. No need to rent a car or arrange a private transfer. Passengers who join Franschhoek Wine Tram via City Sightseeing will either experience the orange or purple routes which include estates like Allée Bleue, Solms Delta, Boschendal (Cellar Door), Plaisir de Merle, Vrede en Lust, Noble Hill, Babylonstoren and Backsberg. You can choose three estates to visit. Tickets are available from the City Sightseeing website and include transport to and from Franschhoek in a luxury air-conditioned coach, entry to the Franschhoek Wine Tram, and a complimentary wine tasting on board the wine tram. They exclude lunch or wine tastings at wine farms. Get your hands on a ticket for just R520 per person! In Franschhoek, you’re truly spoilt for choice when it comes to dining options. Alle Bleue does fantastic picnics, which are perfect for summer. There is a jungle gym, jumping castle, and sandpit to keep kids occupied while you enjoy a relaxed lunch under the trees. There are also kids and vegetarian picnics available. At Solms-Delta’s Fyndraai Restaurant you can share in the warmth of the Cape in abundance: hospitality, generosity and really good food. Food that’s unpretentious, proudly local and just as adventurous as their wines. Explore the diverse culinary history of the Cape, which unites European, Asian and African ingredients, and reimagines them for contemporary tastes. The Werf Restaurant at Boschendal uses local, seasonal ingredients with beef sourced from the herd of Angus cattle on Boschendal Farm, house-smoked trout, or pasture-reared poultry. The Deli is a family-friendly spot serving serves delicious breakfasts, lunch, and afternoon tea. Choose between tables in the cosy restaurant or under the oak trees. Rhone Homestead offers Sunday buffet lunches. There are also two picnic spots: Rhone Rose Garden Picnics and Werf Picnics. Vrede en Lust is home to the Lust Bistro and Bakery, where you can enjoy artisan breads, breakfasts, and lazy lunches. Design your own pizza, share a Ploughman’s Platter, or choose from the extensive a la carte menu. Noble Hill serves up Latin-inspired picnic baskets with albondigas, guacamole, bolillo rolls, and many more delicious treats. Veggie options are available too. The Coseacha Restaurant has new specials daily made with fresh seasonal ingredients. Babylonstoren has a lot to offer guests, from walks in the huge fruit and vegetable gardens and wine tasting to healing tea ceremonies and gourmet cuisine. Babel serves farm-to-fork meals made with ingredients from the estate’s expansive gardens. Greenhouse Restaurant serves simple but hearty dishes, and no bookings are required. Backsberg’s restaurant is the place to go for a terrace lunch, picnic beneath the trees, or the three-course Sunday carvery.